We use the rule of thirds because it is a reliable tool to aid with composition. It sits high on the list of compositional rules that we teach in the Photography School and we often find that it's something that people have heard of, even if they are very new to photography. We use the rule of thirds because it works. However, every now and again, we find ourselves saying to our students that perhaps opting for a radical subject placement or even, heaven forfend, a centrally positioned subject, would be of benefit to their compositions. It isn't so much that the rule of thirds isn't working, but that by breaking the rule, you can achieve something better. As a general rule, centring a subject leads to a flat, dull-feeling image. There's a lack of tension and the eye tends to get bored and go for a wander relatively quickly. But every now and again, placing your subject central within the frame creates a strong composition. It works very well for symmetrical subjects, or nearly symmetrical subjects, as Violet the Pekin Bantam illustrates so aptly here. Placing her according to the rule of thirds has left a lop-sided, uncomfortable photo. Central subject placement is also handy if you're opting for a square crop, too. The rule says that you should aim to have your horizon running along one of the tri-lines that divides your frame according to the rule of thirds. Often that works brilliantly and it's an easy trick to stop you splitting your frame in two across the middle with a skyline, which, unless you have a reflection in your scene, is normally an uninspiring composition. However, if your foreground is especially dark, perhaps if you're shooting a sunset, that will leave you with at least one third of your frame eaten up by black. Move the horizon down in the frame. Place it almost at the bottom. Much better. Negative space is a fantastic concept that brings a sense of calm to images. You often hear it being described as allowing your subjects room to breathe. I've given you two examples here that make extreme use of negative space. 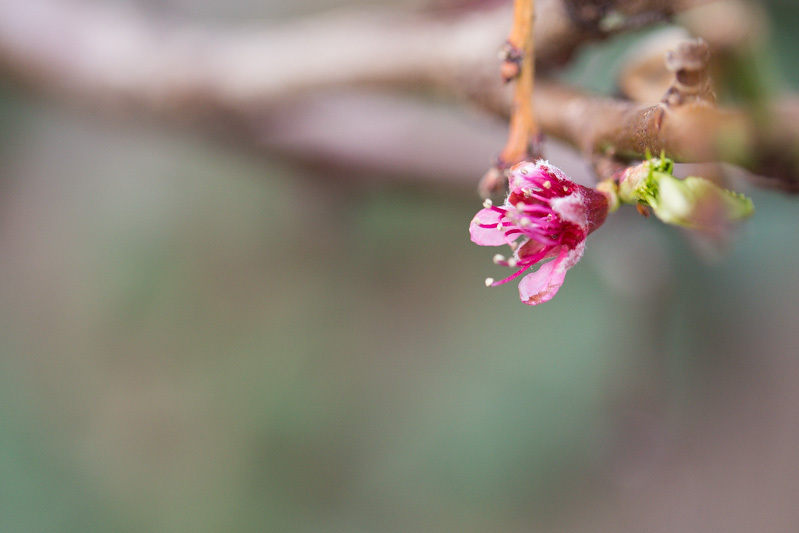 First, we have the vivid pink peach blossom against the soft green background. It's the contrast between the green and the pink that lends this image its tension, and by placing the blossom in the upper right corner of the frame, it makes the most of it. When it comes to the two racehorses making their way across the heath, by placing them (also, as it happens) high and to the far right of the frame, completely ignoring the rule of thirds, it presents a far more interesting story for the viewer. Where are they going? How isolated are they really? The photo isn't so much about the horses themselves, but about the horses and their interaction with their environment. Choosing an unusual subject placement comes down to the same question that using, or breaking, any photography rule poses: how does this contribute to the story my photo is meant to tell? Don't do anything for the sake of doing it, whether that's use the rule of thirds, or not. Do it because it makes for a better photo.